If you asked me 24 hours ago what my impossible wish was, I would have said something along the lines of ‘world peace’ or ‘seeing Ziggy Stardust-era Bowie in concert’. Today, though, my impossible wish is very different: I want to play Middle-earth: Shadow of War with J.R.R. Tolkien. I want to see the dismay on his face as it tears apart his intricate lore. I want to see the lights of his eyes fade away as he endures the shark-jumping final act. Effectively, I want to torture one of the greatest fantasy authors that ever lived with a videogame. Related: how the Shadow of War devs (try to) stick to Tolkien lore. If you are a Tolkien purist, Shadow of War’s plot is a repeated series of palms that reach out from your monitor to rest firmly on your face. That developers Monolith found an excuse to turn giant spider Shelob into a darkly sensual woman is only the start of its descent into seemingly LSD-fuelled fanfiction. Yet, despite my love for the books’ lore and history being torn asunder, I adored almost every one of the 30 hours I spent playing Shadow of War. That is largely down to the Nemesis system, which returns in a stronger, more strategic form. 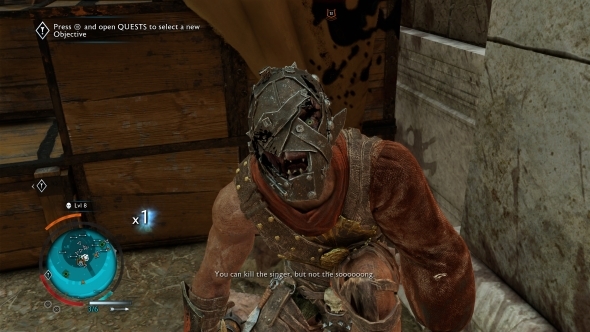 As with Shadow of Mordor, the Nemesis system in this sequel randomly creates a horde of special orc Captains and Warchiefs, complete with their own personality quirks and specific approaches to battle. Fail to kill one in combat and they will pursue you across Mordor, with each repeated encounter adding something new to your rivalry. A particular favourite relationship I forged in my campaign was with Nazu the Bard, a musical orc armed with a song and a lute, who returned to battle with a metal face mask after I torched the flesh from his skull the first time around. The variety of orcs is much stronger this time around, with a plethora of vocal styles, body builds, and armour types. Orcs are now split into tribes, influencing how they’ll look and behave in combat. Mystics, for example, can cast curses, while Beastmasters will ride into battle on Caragor mounts. But while these elements offer incremental improvements over the previous version of Nemesis, it is the new Fortress system that really pushes the feature into new ground. 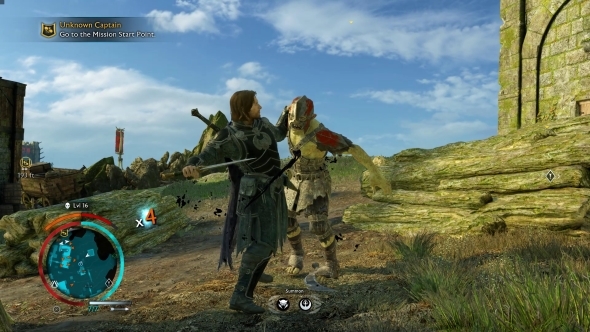 The end goal of this new pursuit is for Talion and his elf-spirit/parasite Celebrimbor to gather an army that can be used to besiege and capture five key fortresses scattered around Mordor. These forts act as the capital to each of the small open-world maps that make up the game’s recreation of Middle-earth’s most dangerous country. If you quickly grew tired of Shadow of Mordor’s brown, miserable environments, then you will find the variety present in its sequel pleasing. From the majestic white stone of Minas Ithil, through the dense forests of Nurnen, to the snow-capped mountains of Seregost, there are some stunning environments to explore. Of course, if you are after industrial smog and the lava trails of Mount Doom, Gorgoroth is always open for business. This process of capturing these areas from Sauron’s forces involves stealing troops from the enemy, infiltrating their ranks with spies, and culminates in spectacular attacks on enemy fortresses that act as the game’s Helm’s Deep moments. From this process blossoms a beautiful campaign. Constantly generated missions, largely portraying the infighting between orc captains, means there is always something to get involved in, and using these opportunities to increase your ranks is a joy. From an unseen perch you can watch rival orcs brawl, and just as one is crowned the victor you can dive down, tear them apart, and claim him as your own. Interrogating specific orcs reveals information on the enemy’s troops, too, which you can use to plan your next strike. I took great pleasure in methodically tracking down the bodyguards of every Warchief, branding them, and forcing them to stab their masters in the back as my army stormed their keep. The minor details of the Nemesis system are constantly changing while you play; as captains tear into each other, new orcs take their place, and victors are promoted to be guardians of their fortress. Within your own ranks, orcs you have captured can decide to rebel, leading to sudden changes in your master plan. The chops and changes means it gives you so much so it becomes its own endgame – the game’s post-finale chapter is entirely focused on attacking and defending Mordor’s fortresses from Sauron’s hordes. Speaking of which, the endgame is the purest aspect of Shadow of War you will find. That it could be its own separate game is a demonstration of how strong Monolith’s improved Nemesis system is – everything else in the game might as well be a fly in the ointment. In fact, Shadow of War is laden with open-world tropes: there are dozens of map icons, indicating towers to climb and treasures to find. Absolutely all of them are superfluous crutches that the game doesn’t need. I don’t see how any player would want to spend time finding hidden elven poetry when they could be interacting with squabbling orcs (although, I will admit, as far as collectables go, poetry is very in-keeping with the language-obsessed Tolkien). Then there are the five campaign questlines, which range from inoffensive to painfully dull. The Gondor storyline tells the tale of how Minas Ithil fell to the Witch-king and became the Tower of Sorcery. Despite a couple of exciting moments that would not have looked out of place in Peter Jackson’s films, the quests have little ambition beyond repeatedly tasking you with untying captured soldiers from orc prison camps. 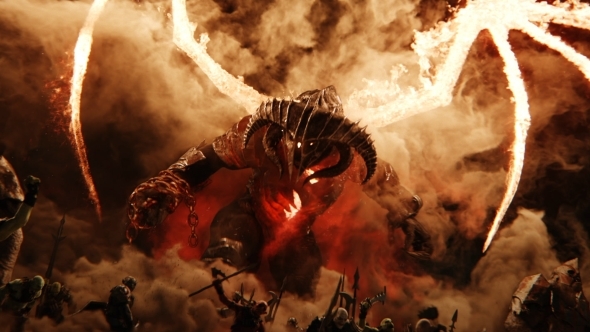 Other questlines see you take on some of Middle-earth’s most infamous evils in huge battles, but the combat system – while incredibly fluid and perfectly suited to savagely butchering crowds of Uruk-hai – simply does not work for boss-style encounters of this scale. As such, they are resolved through quick time events, and there is nothing less satisfying than defeating a millennia-old creature with a fumbled press of the Y button. Shadow of War’s insistence on introducing the most mythic elements of Lord of the Rings, plus all the open-world nonsense, seems to suggest that Monolith don’t have confidence in the mechanics and ground-level orcs that make people excited about the series. 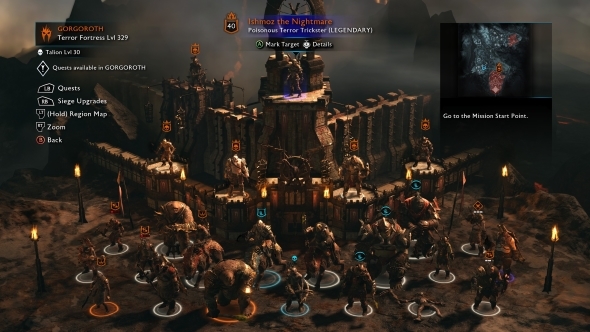 The game’s epic moments come from running towards an enemy fort with your warchiefs, surrounded by a hundred Uruks roaring in the name of the Bright Lord. It doesn’t need Balrogs and Ringwraiths and hidden artefacts; they are all unwelcome distractions that feel as if they have been included because they’re the mandatory requirements of an open-world Lord of the Rings game. 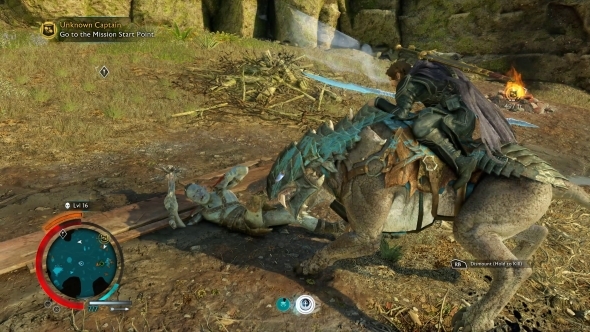 The game even hides its best asset – the army building and fortress assaults – behind an hours-long first act that functions more as an extension of Shadow of Mordor rather than a genuine sequel. Talking of unwanted elements, Shadow of War infamously features microtransactions. If you are one of the many people quite rightly concerned by this, you can put your fears to rest. While they can impact the game by offering new orc followers and gear that can buff your stats, such additions are completely unnecessary and can be ignored with absolutely no consequence. I played the game from start to finish without even opening the Market tab of the menu, and never did I feel as if my progress was being curbed in an attempt to syphon cash from my wallet. Should you wish to buy a few boxes, the standard versions can be purchased with in-game currency (by the end of the campaign I was absolutely drowning in it, since it is mostly only used to buy siege upgrades), or you can pay real-world cash for boxes that provide better quality gear. I would not advise it, though; it is more fun to gather orcs and gear by actually playing the game. I wish Shadow of War was as confident in itself as I am in it. Had Monolith proudly led with the Nemesis Fortress system and introduced players to it quickly, they would unquestionably be on the shortlist for making the Game of the Year. Thankfully, the system acts as the Mithril-strong foundations for the game, so while the additional elements may be generic and unwelcome, there is very little digging required to find the shining silver. That surface of ash and smoke may have prevented Shadow of War from attaining its rightful score, but it certainly does not prevent it from being one of the most joyous games you can play this year. 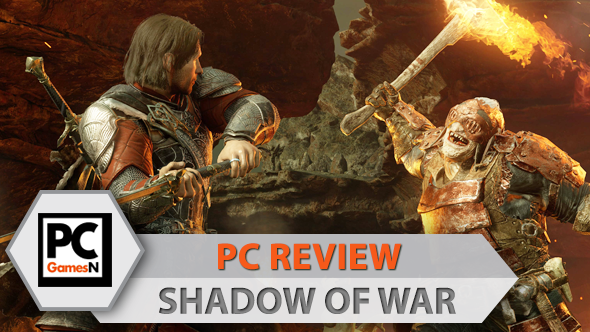 A full tech review, detailing Shadow of War’s PC performance, will be published later today.